[ W. Macqueen-Pope, theatre historian. ] Typescript of '"Train 68". A Play in One Act by James Macqueen. (W. Macqueen Pope)'. + 15pp., 4to. In good condition, lightly aged. Nicely presented, attached by brass studs in grey covers, with paper labels on front. Unpublished. 'Who's Who in the Theatre' records this title among 4 plays by Macqueen-Pope. [ J. B. Platnauer. ] Typed Letter Signed ('Plat') to theatre historian W. Macqueen-Pope ('Popey'), accompanying a typescript of his unpublished pseudonymous play 'David and Jonathan'. Letter from the Ministry of Works Press Office, on government letterhead of Lambeth Bridge House, London. 7 May 1946. Typescript undated, to be returned to Platnauer at 43 Arlington Lodge, Baytree Rd, London SW2. ONE: Letter: 1p., 12mo. In good condition. Pope's 'stimulating verve' over 'an excellent lunch', at which 'Stoll' (a member of the family of Sir Oswald Stoll) was present, emboldens Platnauer to hope that his play might be 'a commercial success, despite the admittedly rational principles upon which theatrical choice is based today? Tastes change - usually before the pundits are aware of it. [ 'Allan Aynesworth' [ Edward Abbot-Anderson ], English actor. ] Five Autograph Letters Signed, one to Cyril Maude and rest to W. Macqueen-Pope, about a benefit performance for Maude at the Haymarket Theatre, and containing biographical information. Both from Larkwood, off Chobham Road, Camberley, Surrey. Letter to Maude dated 14 February 1942; letter to MacQueen-Pope dated 9 April 1942. BThe five items in fair condition, lightly-aged, with slight rust staining from paperclip. In a difficult hand. ONE: ALS to Macqueen-Pope, 20 March 1941. On his Larkwood letterhead, with 'From Allan Aynesworth' at head. Undated. 3pp., landscape 12mo. Providing a deal of information about his association with Maude, the last page beginning: 'Friendship about 50 years. We joined the Garrick & Beefsteak Clubs where we dined together with so many of our Theatre Friends Inc. Wyndham Irving Alexander Hare & Kendal to name a few. [ Paschoal Carlos Magno, Brazilian playwright. ] Typescript of his play 'This is Glory', with Typed Letter Signed from his agent Mrs T. C. Dagnall. The play without place or date. 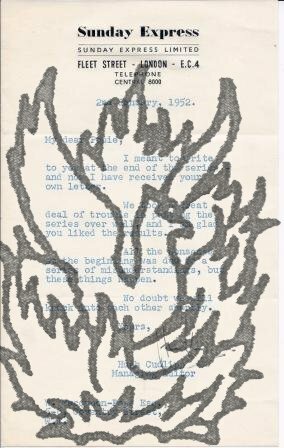 Evelyn Dagnall's letter on her letterhead as 'Mrs. T. C. Dagnall | Dramatic Agent | in association with | A. M. Heath & Company Ltd.', London. 13 May 1946. Both items in good condition, on lightly-aged paper. ONE: Typed playscript. 85pp., 4to. Typed in black and red on rectos only. Typed by May Hemery of London. Bound into black card covers, with label on front. TWO: Typed Note Signed to theatre historian W. J. Macqueen-Pope from 'Evelyn Dagnall', i.e. the dramatic critic Mrs T. C. Dagnall. [ Edward Fitzball, English playwright. ] Autograph Letter Signed ('E. Fitzball.') [ to Charles Kean ], requesting a box for a performance of King Lear [ at the Princess's Theatre ]. 9 Upper Fitzroy Street, Fitzroy Square [ London ]. 18 May 1858. On his Old Bond Street letterhead. 30 November 1949. 1p., 8vo. In fair condition, lightly aged. He begins by thanking Macqueen-Pope for a 'kindly reference' to him in his 'admirable book about The Gaiety'. He has noted a reference to 'Henly' in the index, and identifies this figure as Edward John Henley, brother of William Ernest Henley, whose poem 'Ballade of Dead Actors' he transcribes. He explains that Henley stayed some time in America after going there with a production of 'Deacon Brodie', a play by his brother and R. L. Stevenson, 'and, in 1897, I made my first production, "John Gabriel Borkman," in New York, with E. J. On letterhead of 'The Lawns', Arundel Road East [amended in autograph to Arundel Drive], Saltdean Essex. 26 August [no year, but between 1948 and 1954]. 2pp., 4to. In fair condition, lightly aged and creased. After beginning 'Dear Popie / | How are you?' she asks what the 'immediate prospects' are for her to 'get a book and a series in the paper running', as she has 'scanned a tremendous amount of George's material' since moving to 'The Lawns'. In a postscript she describes the material as a 'wonderful story for T.V. too to say nothing about the films! ', adding that she has 'got G. to record a lot of his old & recent material ready!' Macqueen-Pope was an admirer of Robey's, as his 'The Melodies Linger On: The Story of Music Hall' makes clear. [ Paul Bugeja, Maltese author. ] Typescript of a play: 'Honour Her Brave People. A Tragedy in 3 acts about conditions in MALTA G.C. as they are and as they might be'. With covering Typed Letter Signed to the theatre historian W. Macqueen-Pope. Play from 13 Caledonia Mansions, Qui S Sana, Sliema, Malta G.C. Undated [ containing reference to 1942 ]. Bugeja's covering letter from same address, 30 June 1952. ONE: Typescript. + 94pp., 4to. Stapled in green tyed wraps. In good condition, on lightly-aged paper; in aged and worn wraps. Stage directions underlined in red pencil, and a handful of minor manuscript changes. 'The action of this play takes place in Malta G.C. [ Walter James Macqueen-Pope, theatre historian. ] Two Typed Drafts of article: 'It Was Top of the Bill | The Story of Music Hall.' One draft with autograph emendations. With copy of covering letter to Greville Poke, editor of 'Everybody's' magazine. Drafts without place or date. Covering letter to Poke dated 20 January 1951 [ without place ]. ONE: The earlier of the two drafts, titled 'It Was Top of the Bill | The Story of Music Hall. | by | W. Macqueen-Pope.' 14pp., 4to. Paginated 1-12, with two further pages carrying material to be inserted. With a few autograph emendations, including an addition to the ending. Macqueen-Pope writes knowledgeably and with a passion for his theme, which is that 'Music Hall reflected public taste even more accurately than did the "legitimate" Theatre because it was created by the people themselves. The basis of the Drama of the Theatre - was religion. [ Naomi Jacob, author and actress. ] 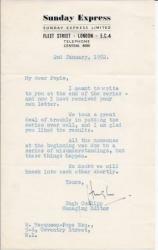 Two Typed Letters Signed (both 'Mickie') to W. Macqueen-Pope, on subjects including Ellen Terry, Bernard Shaw and Teddy Knox of the Crazy Gang's 'Nervo and Knox'. Both from 'Casa Mickie [ the second spelled 'Casa Micki' ], Gardone Riviera, Lago di Garda, Italy. 16 July [ 1953 ] and 5 August 1953. Two chatty and characteristic letters. ONE: 15 July . 2pp., 4to. On aged paper, with wear to edges and vertical closed tear at foot. She begins by praising his books 'Ladies First' (1952) and 'Shirtfronts and Sables' (1953), adding in an autograph note 'Yes I bought them when in London.' The first contains 'that wonderfully beautiful tribute to Ellen Terry. I don't know when I have read anything which moved me so deeply, you rose to great heights when you wrote that. You are beginning to run James Agate very close on my shelves'. [ Phyllis Hartnoll, theatre historian. ] Correspondence with her agent W. T. Macqueen-Pope, impressario Jack Hylton and actress Freda Jackson regarding her translation of 'The Lady of the Camellias', together with two versions of the translation. Correspondence dating from 1948, except for single items from 1947 and 1950. Hartnoll's letters either from Hobbits, Nether Westcote, Kingham, Oxon, or on Oxford University Press letterheads. Other correspondence from various London addresses. An interesting collection, giving an insight into theatre practices in post-war Britain. Hartnoll is commissioned by the actress Freda Jackson, then at the height of her popularity, to produce an adaptation of the play, Jackson gets impressario Jack Hylton and producer Anthony Hawtrey on board, and there is the inevitable falling out between the actress and the author, with Macqueen-Pope, who is acting as Hartnoll's agent, playing the mediator, as matters become acrimonious. 148pp., 4to. Bound with pink ribbon into grey card wraps with typed label on cover. In fair condition, on aged paper, in worn and aged binding. Pencil note on title page states '40000 words'. An interesting piece of social history during wartime. In a foreword Macqueen-Pope thanks a number of individuals for their assistance, adding that 'the leading characters in this real life story must perforce remain anonymous'. [ Joe Corrie, Scottish miner and playwright. ] Corrected typescript of the 'English Version' of his play 'A Master of Men', with Typed Letter Signed to the theatre manager W. J. Macqueen-Pope. For more about Corrie see his entry in the Oxford DNB, which states that 'His most effective mature work, A Master of Men, about the conflict between a mine manager, the mine owners, and the miners, was performed by the Glasgow Citizens' Theatre in 1944.' 111pp., 4to. On paper of various colours. Autograph title-page: 'English Version | A Master of Men | A Play | Joe Corrie | Hill's Hotel | 41 Princes Sq. | London W2 | Tel. Bay. 0118'. (Many of Corrie's plays were written in Lowland Scots.) In good condition, lightly-aged, in worn buff card wraps. With a few autograph emendations. Typed Letter Signed ('Hugh') from Hugh Cudlipp, as Managing Editor of the Sunday Express, to 'My dear Popie', the theatre critic W. Macqueen-Pope. 2 January 1952; on Fleet Street letterhead of the Sunday Express.